The Food Guide has a strong theme of reducing sugar intake. This can be seen throughout the guide with the emphasis on increasing vegetable intake, choosing whole grains, avoiding foods with added sugar and limiting the intake of fruit juice. These are all important strategies for helping to keep blood sugar under control and reducing the risk of diabetes and diabetes complications. Sugar is also a key contributor to flare-ups of neuropathy symptoms. The Food Guide no longer recommends juice as a source of fruit. This is an important step in changing the drinking habits of Canadians. Fruit juices are loaded with as much sugar as pop. Water is now featured as the beverage of choice. This is important as drinking enough water is important for healthy blood flow to the extremities and necessary to support proper kidney function. This is an interesting change as previous versions of the food guide have emphasized 'meat and meat alternatives'. The present version of the guide focuses on protein from all sources. This is an important distinction as there are many studies showing the health benefits of vegetable-based proteins (i.e. lentils, soy) for healthy blood sugar control and increasing dietary fibre. Some meat choices can have high saturated fat content or be highly processed. These negative aspects far outweigh the benefits of the protein. This is a new aspect that promotes the social benefits of slowing down to share mealtime with others. This was first seen in the Brazilian food guide that was designed by researchers from the University of Montreal. This section also emphasizes meal planning and preparation for our busy lives. We must be mindful that planning and preparation are important ways to ensure healthy eating, reducing food waste and avoiding the need to pick up highly processed food on the go. The Food Guide was developed based on current nutritional science research and was not influenced by lobbying efforts from food groups (e.g. Dairy Farmers of Canada). As a result, there is less emphasis on specific types of food within the guide. 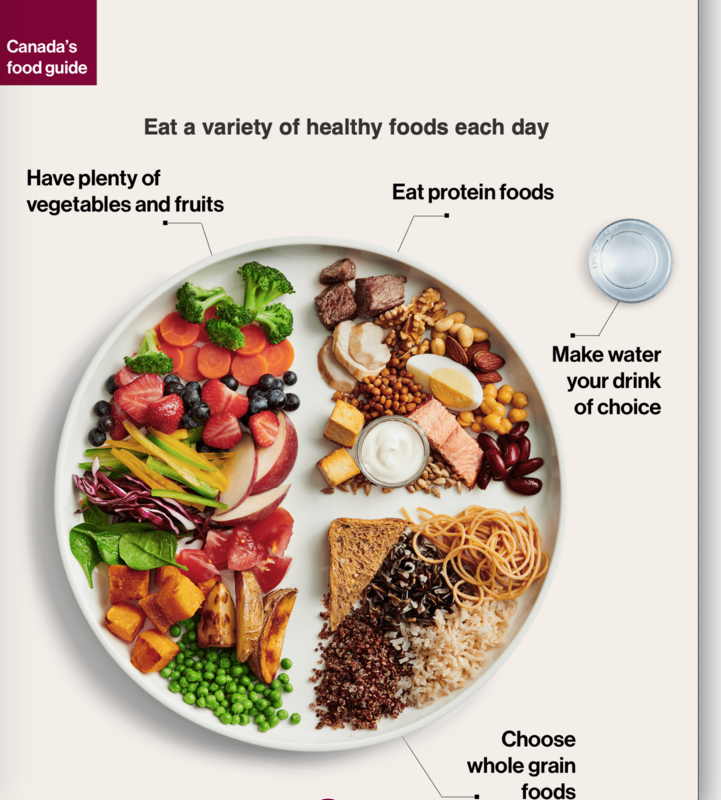 This is important because Canadians are encouraged to eat a wider variety of foods within the nutrient groups.